The sun is nearing a low-activity point of its solar cycle, but researchers at NASA are detecting large solar flares leaving the celestial body. On Wednesday, NASA recorded two massive solar flares — one was the biggest flare in 12 years. They were so powerful, they kept some radios from working for about an hour. The two solar flares shot out of a sunspot that's seven Earths wide and nine Earths tall. Astronomers identified them as "X-class flares," which generate as much energy as millions of hydrogen bombs and emit enough radiation to interfere with high-frequency radio waves here on Earth. Solar flares occur when the sun's magnetic field suddenly releases energy, like a snapping rubber band. It sends huge amounts of energy and light into space. The event is somewhat surprising because the sun is nearing a period of low activity it cycles through about once every 11 years. But there's been quite a bit of activity on the star's surface. 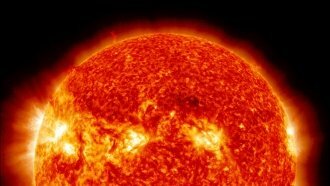 The same sunspot sent five "sizable" solar flares total into the atmosphere since Monday. Earth's magnetic field shields us from the most dangerous effects of these giant explosions, but scientists think the flares might still trigger a geomagnetic storm. This could disrupt satellites, GPS navigation and even create auroras seen as far south as Ohio or Indiana.